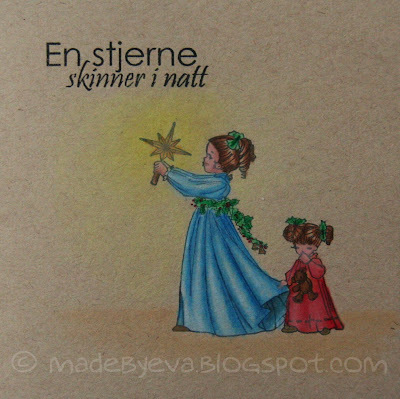 This line from a Norwegian christmas song (one of our modern classics), "A star is shining this night", seems to be the perfect match to this cute image. I've coloured the girls using Prismas as usual. The blue dress is easy, but I have precious few red colours in my kit, and had to use some white and 20% Frech Grey for the highlights. No more red dresses. ;) Some shimmering chalks create the soft background.